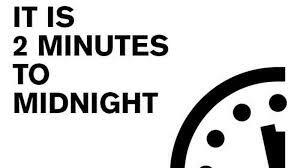 The Nobel Peace Prize and the Doomsday Clock – The End of Nuclear Weapons or the End of Us? On May 9th 2018, an important new article was published in the New England Journal of Medicine, “The 2017 Nobel Peace Prize and the Doomsday Clock – The End of Nuclear Weapons or the End of Us?”, co-authored by ICAN’s founding chair and former MAPW (Australia) President, Assoc Professor Tilman Ruff. The NEJM has a long history of publishing leading work from around the world on the nuclear weapons danger. Please click here to download a copy and distribute this as widely as possible among your colleagues and urge their support for MAPW, for example through joining us. Thank you for your efforts at this critical time.